Scotland is a small country with big plans. It has no time for daydreamers or dilettantes. If you want to do something here, you do it for real, and you do it right. Which is why Scotland is on track to achieve an extremely ambitious environmental goal: becoming a zero-waste country by 2025. But to do that, everyone has to pull together in ways that are not always convenient and not always fun. This is the trash collection schedule for my neighborhood, and they don’t have a sense of humor about it. You’ll notice that there are five different bins—glass, plastic and paper, garden waste, food scraps, and landfill—collected in different combinations at different intervals. Just for fun, the intervals change, depending on the time of year. I ask you. It seems like a challenge. Rather like my children’s school schedule, which is a matrix of eight periods, five days a week—not so unusual, except that some classes meet every day, others meet a few times a week, and still others gather once every few weeks, or even once a month. Some days there are back-to-back periods of the same subject taught by two different teachers in two different rooms. And oh yes, the schedule changes monthly. Sometimes I think Scotland likes to mess with people, to see if it can get them to leave. Because the paradise they’re planning will go a lot farther once the suckers have weeded themselves out. What paradise? You might ask. Well, back to that zero waste thing. The plan is that by 2025, only five percent of all waste will find its way to a landfill (link). Seventy percent will be recycled, and the rest—like food and garden waste—will be broken down and turned into something useful. In the United States, food waste is the single largest category of waste going into landfills (link) and is the third largest source of methane emissions. Despite an optimistic opt-in program aimed at food producers, restaurants, institutions, municipalities and households (link), large-scale food waste collection hasn’t really taken off in the U.S. This isn’t to say that people don’t want it. As of 2014, nearly two hundred communities had established systems for household food waste collection (link). There is tremendous interest in food recovery and redistribution, and quite a bit of government support (link). However, the sheer size of the United States—Scotland is a little smaller than Illinois, with a population of approximately five and a half million—not to mention the complex relationships between federal, state, and local governments—makes widespread implementation a much trickier proposition. There is also, I believe, a knee-jerk resistance to blanket enforcement of anything that affects individuals’ everyday lives in a quantifiable way. But Scotland doesn’t have time for that. Look, we’re going to do this thing, right? Right. Right, so organize your five bins, memorize the schedule, and we’ll have no whining or messing about or mixing the bottles in with the banana peels. The results are impressive. 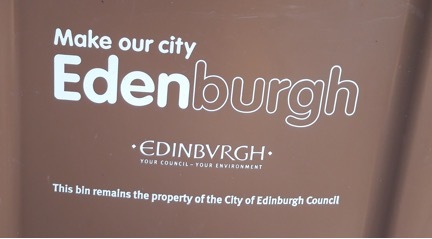 Edinburgh’s food waste also generates methane—but that methane is collected and used both in water purification and to generate household electricity. In other parts of Scotland, it’s used in fertilizer production. And although it took some effort to get used to keeping a week-old pail of food scraps underneath the kitchen sink (shudder), the bragging rights, if not the success of the program, has made the effort well worth it. As an added measure of encouragement, household bins are small by American standards, which means that if you have anything large, anything unusual, or anything in great quantity that you want to be rid of, you have to take it to the dump yourself. When I say ‘dump,’ of course I mean recycling center. 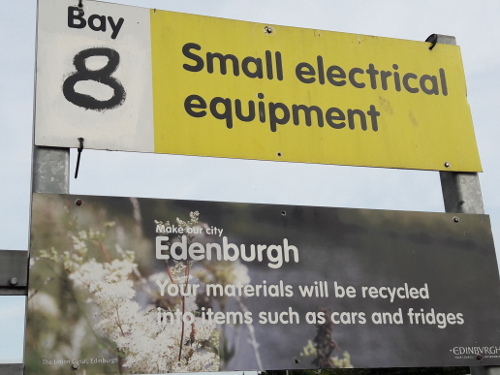 And, with twenty different categories, the recycling center we visited—one of several in Edinburgh—was pretty neat. This will definitely put a crimp in your Amazon habit, by the way. Because bins are too small to accommodate huge amounts of packaging, default online shopping means more trips to the du…er recycling center. To say nothing of the fact that taking delivery is a right PIA. One is expected to be home to sign for every delivery. If one is not, the package may end up in unexpected places, such as…one of the bins. Or back at the post office, with a ransom attached, to be collected at your inconvenience. Which one might say is another way of taking one for the team. When it’s more convenient to shop in person, local business thrives. And it does, here. In many areas of the United States, a combination of online purchasing and big box superstores has killed large segments of independent brick-and-mortar business, but Edinburgh has several large and vibrant shopping districts comprised of almost exclusively individually-owned businesses—and these businesses are bustling. There are complex factors at play, of course, but two, to which I can personally attest are the problems of packaging disposal, and the fact that in-person shopping is often quite a bit more convenient than online purchasing. As a result, the numerous Main Streets (or “high streets,” as they’re called here) in Edinburgh—and in the other towns and villages I’ve visited—are busy during business hours, and they consist of a great deal more than restaurants, nail salons, and other services that are—for now—not able to be delivered by drone. Waste is one of the largest environmental problems we face today. But Scotland is proving that with societal determination—and individuals’ willingness to subject themselves to a wee bit of inconvenience—a zero waste society is possible. Can larger countries use their example—scale it up, perhaps—to work for them? Will they choose to? I don’t know, but I hope so.